Last week we talked about how to buy and start a simple website using WordPress. Today, we’ll start customizing our WordPress site and get you off on the right foot to having a great quality, feature rich website. We’ll take a quick walk through the menus of WordPress and help to make it easier on a first time user, as well as showing you how to start your new site off with a theme and an easily updatable, customized navigation. It can be intimidating to start a new WordPress site, but stick with us—part two of “How to Own Your Own Website” is coming right up. What’s In A Basic WordPress Install? You should be able to find the “back end” of your new WordPress site by visiting your new domain and adding /wp-admin to the end of it. You should get a page that looks quite similar to this one where you can log in and fiddle around with your new page. This is the dashboard. It has a lot of very useful information, including updates and suggestions for new content to start writing, new plugins to add, or settings that you can tweak. Let’s start by taking a look at the options on this page. WordPress is pretty straightforward, but the sheer amount of new stuff to learn can be really overwhelming at first. Here’s a quick breakdown of this menu. Posts creates new blog-style posts. Since WordPress is blogging application, this is at the top of the menu. Media is for uploading pictures, video, and files. You can do it all from your browser, no FTP program required. This makes everything so much easier. 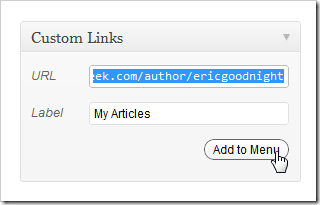 Links is one of the SEO features of WordPress. Use it to create a list links relevant to your content, or as we’re going to do, simply ignore it. Comments allow you to read moderate what’s being said on your website by visitors. Appearance allows you to change the backgrounds, menus, headers, colors, etc of your website and theme. It’s also where you download new themes or templates. Plugins are extensions for your website. They can range from simple to incredibly complex. Many are useful, and some are poor. 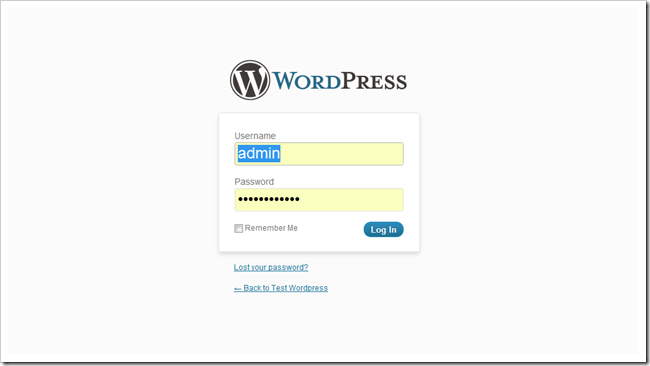 WordPress will find free plugins for you. Users allows you to change your username or add other people to your site. Tools and Settings are technical menus for tweaking aspects of your site. You can also find updates to your software on this dashboard. This will keep WordPress updated to the newest version as well as updating any Plugins, themes, or other software that you install into your WordPress site. By default, WordPress can contact the major blog directories and search engines so that your page can show up as a relevant result. You may want to look under Settings > Privacy and set this to “Ask search engines not to index this site” until you’re happy with your page and ready to get it out there. Or just put it out there incomplete—it probably won’t matter much. Many of the menus have child pages with lots and lots of options. The first two you should familiarize yourself with are Posts and Pages, depending on how you want to use WordPress. If you want to create a blog, “Posts” is probably going to be a place you’re going to spend a lot of time. But if you’re going to make static pages… you guessed it, “Pages” it is. 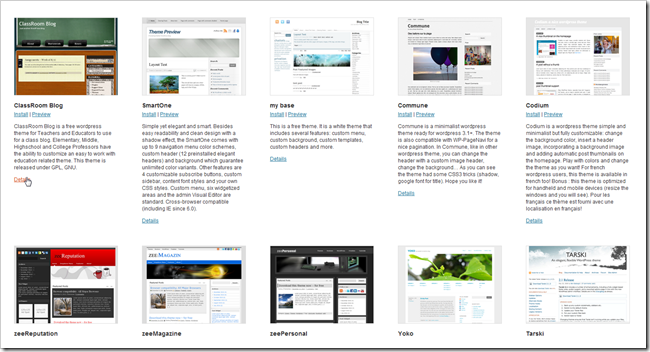 WordPress uses sets of style sheets and designs called “Themes” to customize the layout. This can be a great way for non-designers and non-technical people to make their site look better without a lot of effort, and can give mid-range designers a place to start customizing. 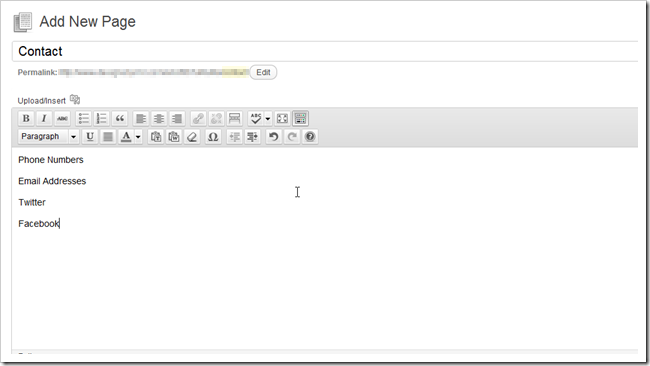 And advanced WP users can make their own themes, either to sell or to give away as free software. You can find this menu by navigating to Appearance > Themes. Installing new themes is a snap. 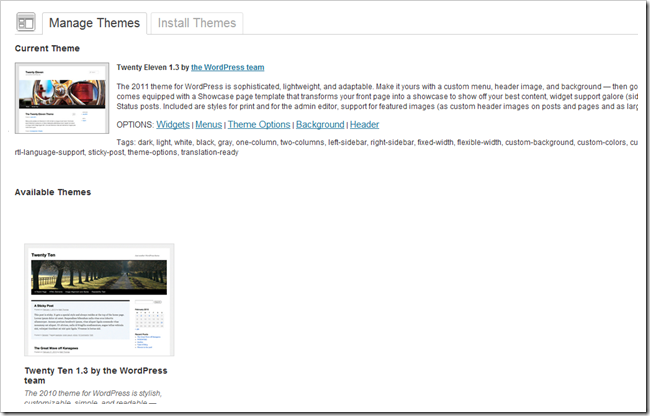 You can simply download new ones through WordPress by switching to the “Install Themes” tab. You’ll find tons of categories you can pick from to find a theme, including color and column layout. Today, we’re going to pick these options, because we want to be able to customize our background, colors, header, and menus of our site. 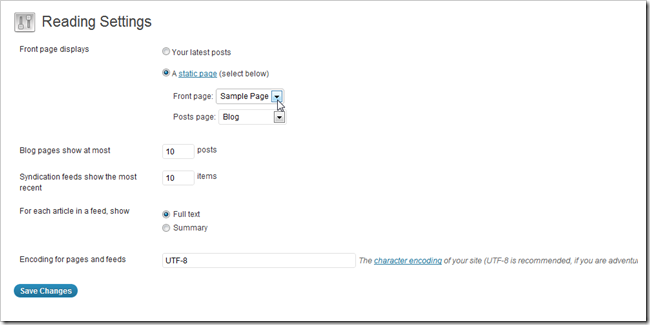 WordPress brings you a large list of themes that fit the criteria you picked. One of the coolest features is that you can preview a theme before you install it. We’ll be using this one for our demonstration. It’s called Picolight. 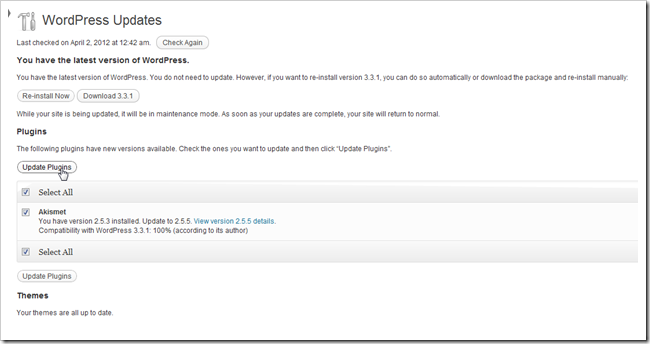 Click install and then click through to download and install the files into your WordPress backend. Even after all the files are downloaded and put in place, you still have to “Activate” it to tell WordPress to use the theme. You’ll also find a lot of options, once your theme is installed and activated. Let’s take a look at those now. Menus are likely the first thing you should begin customizing. 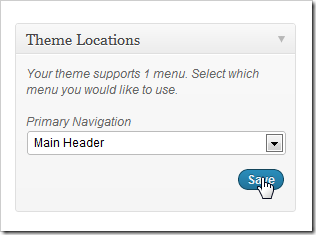 Most newer WordPress themes support “custom menus” which can be edited here. 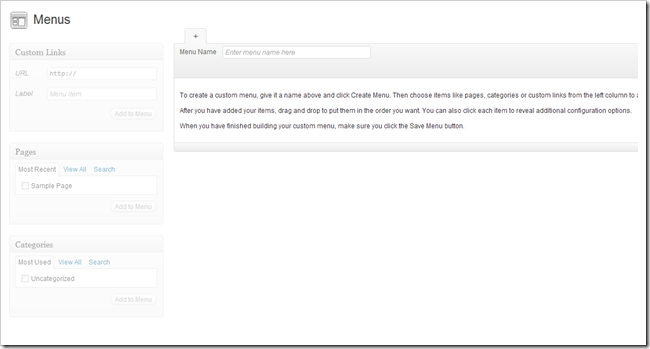 But to start customizing a menu, you have do a few other tweaks first. 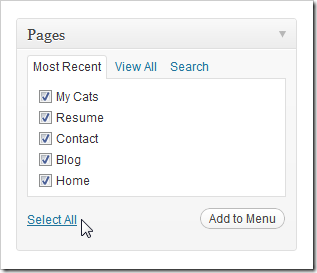 Find Pages > Add New Page and start creating all the pages you want in your menu. You can also delete any pages you don’t want to show up on your site here as well. When you finish your pages, click the publish button to put them out into the world. Continue making pages until you’ve gotten enough to populate your menu, or you’re tired of making them. Your next step is to find “Reading Settings” under Settings > Reading Settings. Here you can change the “home” page of your site to a static page and not the default blog frontpage (if that’s what floats your boat). 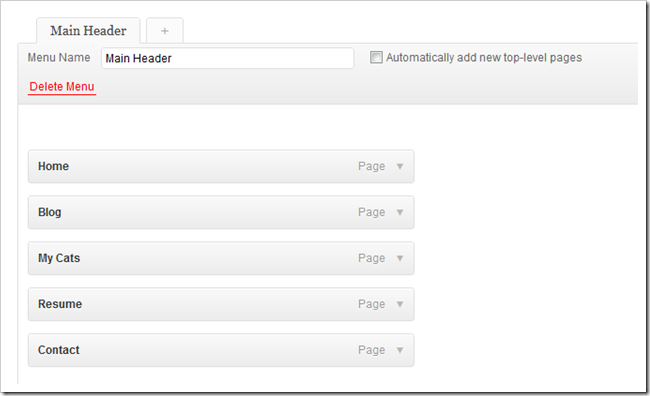 You can also set your blog frontpage to any existing static page. Hit “Save Changes” when you’re done with those settings. Return to Menus by navigating to Appearance > Menus. You can type directly into “Menu Name” to create a menu. Any name is fine, just remember what it was later. The topmost page will appear first in the navigation and the bottommost will appear last. You can click and drag them around to reorder them. You also have the option of adding external links and internal Categories to your menus as well, all pretty handy additions. Find “Save Menu” at the bottom right of the page to finalize the changes. 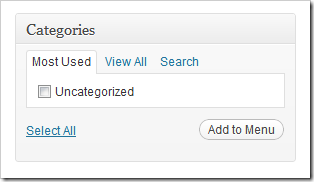 Then simply find the “Locations” section of the same menus page. 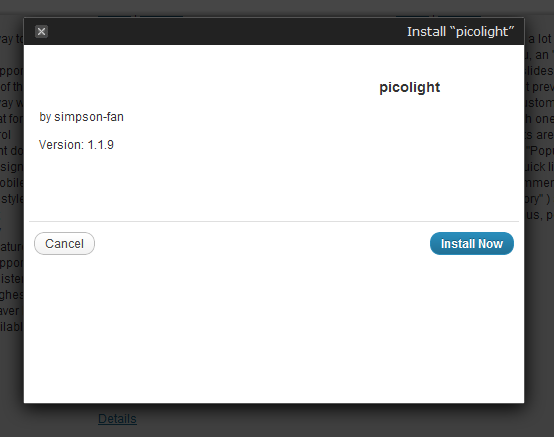 Picolight only supports one menu by default, so we simply select our menu (we named it “Main Header” earlier) and select save. And when we check our frontpage, we find that our new menu is installed and waiting to be navigated. This menu updates from this backend—if you wish to add or remove pages, there’s no need to edit 50 html files. There’s still plenty more to dig through in WordPress. If you’re feeling adventurous, rummage through your install and find out what works for you and what isn’t easy and obvious. We’ll be back with part three before you know it. So, how did we do? Do you feel more confused, or less? Or are you a fabled “web master,” with lots of tips for newbies for their first “real” web page? Tell us what you think in the comments, or send your questions on to ericgoodnight@howtogeek.com. Your questions about WordPress and making basic web pages may be included as a part of the next articles in this series. Image Credit: Cat in the Box by admiller, Creative Commons.